Michael Hurst returns to Waiheke with a reprise of his hit solo show! This show sold out both performances in September, and Michael has agreed to return to the motu in January for two more performances! “Waiheke holds a special place in my heart, as I’ve been holidaying there for years,” says Hurst. Having toured his hilarious take on Shakespeare’s most famous leading men around New Zealand, Australia and to the Edinburgh Fringe Festival, Hurst has been refining and tweaking the show and says it’s in the best shape it’s ever been in. Described by critics as ‘exhilarating’, ‘brilliant’, ‘deranged’, ‘hilarious’ and ‘soulful’, Hurst’s solo outing is the brainchild of Hurst himself and the supremely talented comic writing team of Natalie Medlock and Dan Musgrove (Toys, Christ Almighty!, Dan is Dead / I Am A Yeti). 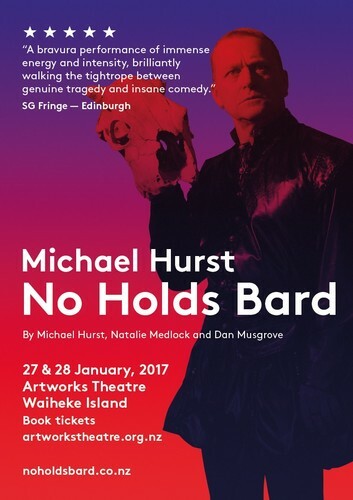 No Holds Bard brings Hurst’s decades of craft and consummate skill to this glorious tour de force, in which four of Shakespeare’s greatest creations come kicking and screaming into the bursting brain of a single, struggling actor. In between seasons of No Holds Bard, Michael Hurst has been busy behind the scenes, directing the reboot of the vintage horror hit Evil Dead and hit TV series 800 Words and Westside. A booking fee for online sales applies, but not for Theatre members, and you're welcome to join first!